If you don’t have a lot of space in your garden, or you live in a flat and only have a balcony, then a space saving DIY herb garden is the best way to grow some herbs. It’s a good place to start if you haven’t grown anything before too. Hello! It’s Dave here. We have something a little bit different to share with you today, and I hope you are going to enjoy these type of posts. As Dannii mentioned a couple of weeks ago, there are going to be some changed to HHH and there will be a new Home and Garden section added. 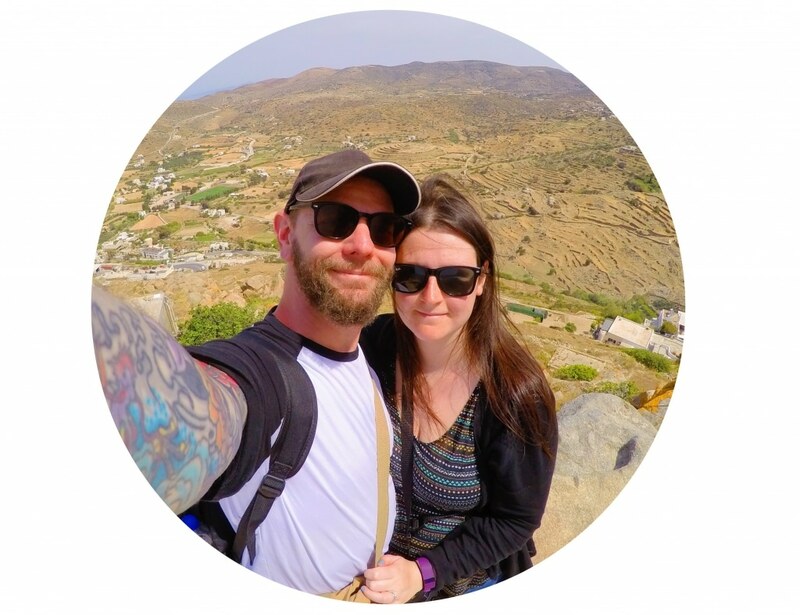 You will mostly see posts from me there, where I share the my latest DIY projects and ways that you can save time, space and money when it comes to all things home and garden. I am really in to upcycling and creating as much space as possible for us to grow our own food, so there will be a lot of those type posts. Do let me know if there is anything else that you would like to see from this section – we are happy to hear idea. We did this last summer and the herbs were so successful, that I thought I would do it again this year and share the step by step process with you all, to show just how easy it is! We went with just a white background last year, but we went colourful this year and I prefer it this way. 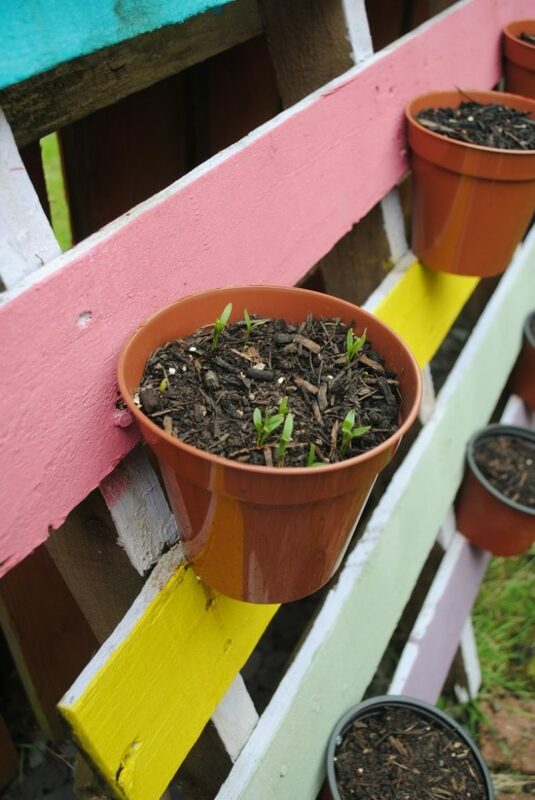 We have teamed up with Wyevale Garden Centres this summer to show you some space saving DIY garden projects that are perfect for beginners as a way to start growing your own food. We posted last week about the Benefits of Gardening, so it’s now time to put that all in to practise and get planting. This is the easiest thing to start with, as it doesn’t involve a lot of time and you just have to screw a few pots in to a pallet. It’s also really cheap to make too. It is worth buying good quality soil and seeds, so you have the best chance of everything growing successfully, which is why we always choose Wyevale Garden Centre products. They have a great selection of seeds to choose from, so you can get growing and their soil is the best quality that we have used, which makes all the difference when it comes to successful growing. Although their garden centres are fantastic, if you don’t feel like leaving the house then you can get everything delivered straight to you. We did that and it was so handy. The gardening posts don’t stop there. I have another DIY space saving project to share with you all soon that grows strawberries, so you can pick fresh fruit straight from your garden. Then, Dannii is going to be sharing a delicious recipe that uses up some of the garden produce you will be growing. We got some building materials delivered and they came on a pallet. That pallet has just been sitting round by the bins ever since, maybe because we are too lazy to break it up and dump it, but then we were thinking of ways that we could use it. We are big on trying not to waste anything and recycling things into something usable, which is how we came up with the idea of turning it in to a herb garden. We are lucky enough to have a decent size garden (one of the criteria for when we last moved), but we have already filled it up with planters that we grow all our vegetables in. We have a planter specifically for herbs already, but the amount of herbs we grow is never enough. If you have been following my recipes for a while, then you will have noticed we use a lot of fresh herbs. They are a great healthy way to make healthy food more exciting. So, we wanted more herbs, but were limited on space. 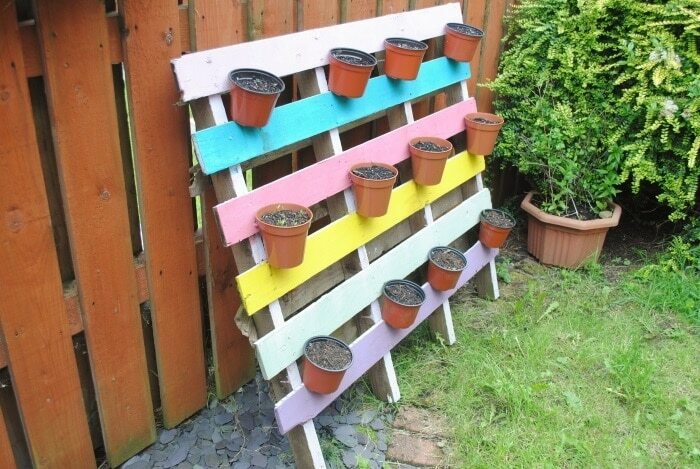 This DIY herb garden that is made from just a pallet and some pots is perfect if you have a small garden, as it doesn’t need much ground space – you can just prop it up against a fence or wall. 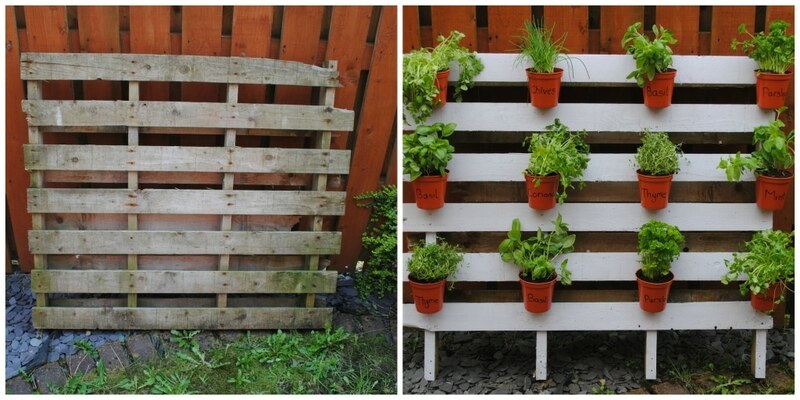 Don’t have a pallet just laying around your garden like we did? You can go in to a builder’s merchant and ask for one, for free. They always have loads laying around and are usually happy to give them away if you ask nicely. If you get the pallet for free, all you have to pay for is the pots and the seeds and a little bit of soil. We painted ours, as we had paint sitting in the shed too, but you don’t have to. So, all of this can be made for around £5 (that’s US $8) and you have herbs for the whole summer. 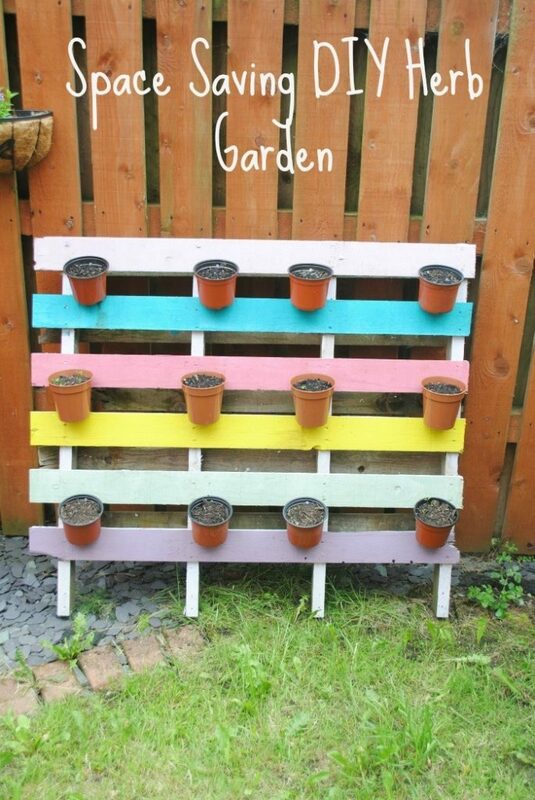 1) Take the pallet and paint (optional). 2) Get some plastic plant pots and screw them in to the pallet (this will be enough to hold them in, as long as they are small pots, as the herbs are not that heavy). 3) Add soil to the pots and plant the seeds. 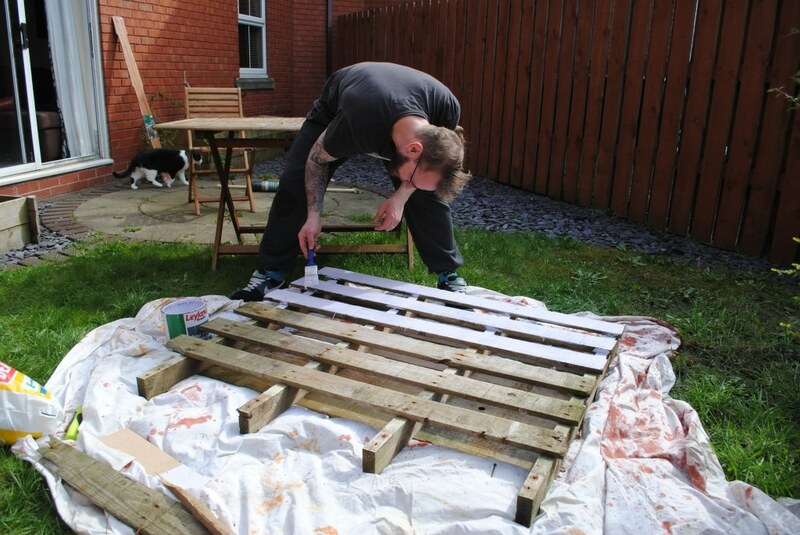 4) Lift the pallet up and rest against a fence/wall. Do you have any space saving garden ideas? great work..cant imagine how it’ll look like when the plants are grown. 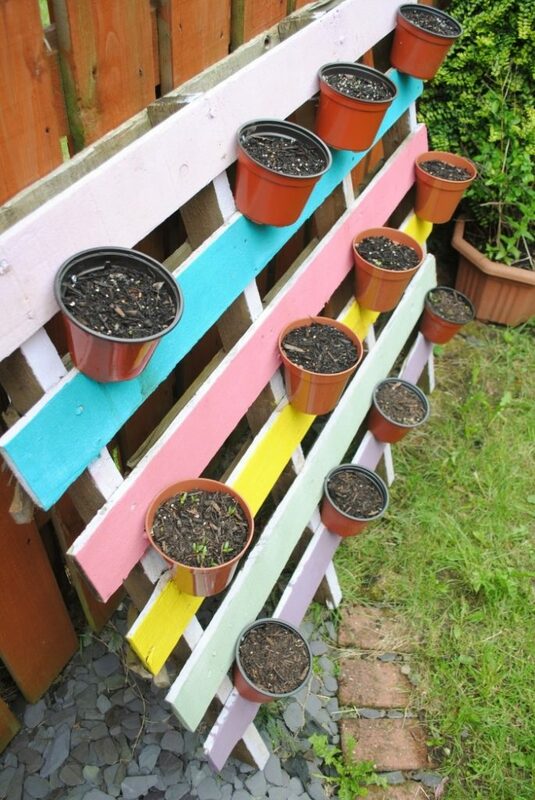 I have always loved these pallet gardens, this is adorable!! Well done Dave! He did a great job, didn’t he. Loving this! Your garden series is SO inspiring. Thank you! There are lots more exciting posts to come too. That’s a great idea to save space.I wish I had enough room to put that where I live. Could you prop it up outside the front door maybe? Girl this is so cute!! I love how you painted different colors!! Yes I live in an apartment and I so need this!! Have a great weekend!! You better get creating lots of mint recipes then haha. I love this DIY idea Dannii! I’d love a herb garden at home, so I’m definitely going to try this out! Thank you for sharing! It’s a great way to get your feet wet when it comes to gardening. This is a really great idea! I don’t have a garden just a small patio and this could be a good way to grow your own veggies! You could definitely make one of these then.